The Naturally Slim® team is always thrilled to hear stories of participants using the program to lose weight and improve their health. We are extremely proud to share that one of our dedicated participants has been recognized with a national award for his personal progress and willingness to help his co-workers transform their lives, as well. 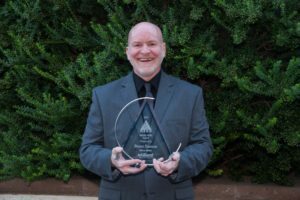 On September 12, 2017, Brent Easton, palliative care chaplain for Mercy Health in Paducah, Kentucky, was named the recipient of the inaugural Alliant Healthy Hero Award at the HERO Forum event in Phoenix. After years of losing and gaining the weight back, Brent renewed his commitment to better health in 2014 by signing up for Mercy Health’s well-being program, which includes Naturally Slim. Three years later, Brent has lost 105 pounds and 16 inches from his waist and has maintained that success. He has also expanded his pledge to healthy living by becoming a tireless champion for his co-workers’ journey on the Mercy Health well-being program. The Alliant Healthy HERO Award is the newest addition to the HERO Workplace Health and Well-being awards. The Healthy HERO Award was created to recognize individuals who have achieved and maintained significant health improvements (at least two years) in a company-sponsored well-being program. The award also spotlights people who volunteer support for their co-workers’ participation in employer well-being programs. A national panel of health professionals selected Brent as the inaugural award recipient from a group of finalists nominated by HERO members. Congratulations to Brent on this wonderful honor and keep up the great work!